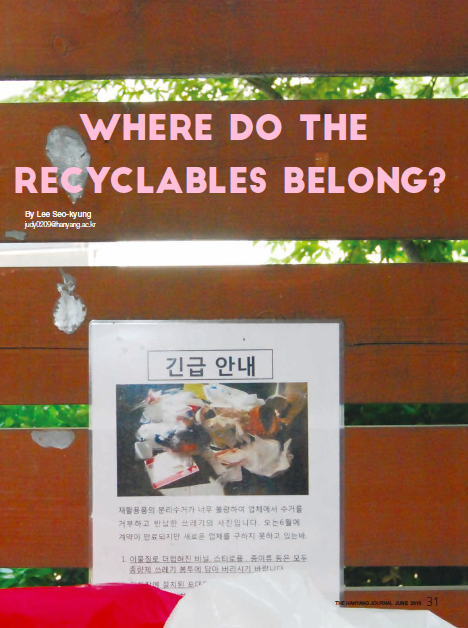 Where Do the Recyclables Belong? Various countries around the world are now suffering from an insurmountable amount of trash. Even though some countries are placing much of the blame on China about the latest trash crisis, what they are all forgetting is that China has actually been importing about half the world’s trash until they finally decided that their environment was under threat. China announced that they would not import any more trash from developed countries, and they plan to add another 32 different types of trash that will be banned by the year 2019. After China’s announcement, many companies that used to collect trash stopped buying specific types of trash, leading to the overflow of recyclables in apartment complexes in Korea. As a result of the ongoing chaos, the Ministry of Environment has announced that all trash companies that are planning to stop collecting any type of trash needs to inform the public at least three months prior to the change.